Pitchfork: Do you keep a notebook? Tom Waits: Oh yeah, everybody does! Life is too confusing. Monkey wrenches, pocket knives, dog food, instant coffee, lipstick. You gotta get it organized somehow. 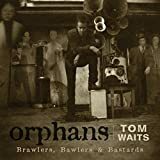 I'm currently enjoying his brilliant new collection, Orphans: Brawlers, Bawlers, and Bastards. Actually, I'm enjoying the Bawlers third of it while I wait for my eMusic monthly subscription to refresh so that I can download the rest.